"It's almost impossible to photograph in the red light district. Everyone is terrified of the camera, and they're frightened of being found out. Everything is illegal. It's a whole separate society unto itself." Filmmakers Zana Briski and Ross Kauffman ventured into the red light district of Calcutta, India—a cramped, filthy, impoverished neighborhood brimming with illegal activities of every sort—to ostensibly do a documentary on the lives of prostitutes and brothels, but what came out was an unexpectedly miraculous story. A very curious thing occurred, as Briski found herself connecting emotionally with the young children of the prostitutes, who immediately swarmed around her like moths to a flame. Amidst depressingly deplorable living conditions, these lovely, bubbly children—who we learn are societal outcasts and most of which are destined to work "in the line" like their mothers—are given cameras by Briski, a modicum of how-to instructions, and are set free to take pictures of life as they see it. What resulted is Born Into Brothels, an alternatingly beautiful and bleak film about innocence and art that deservedly took home the Academy Award for the Best Documentary Feature of 2004. Briski and Kauffman focus on eight children (five girls, three boys), and we glimpse their difficult lives, often with abusive mothers, hash-addicted fathers, and living conditions that would make most of us simply retch. Yet once the cameras are distributed we begin to see the world through the eyes of the children, with a series of photos that, at the outset, contain the expected amateurish framing that slowly evolves into a mixture of beautiful. well-composed snapshots and stark, imaginative angles that reveal a wealth of hidden talent and vision. As the filmmakers got more involved with their subjects, Briski took it upon herself to help break the cycle and get as many of the children she could enrolled in boarding schools. She does battle with a sluggish and seemingly unresponsive Indian government, and even the families, but between this all there is the smiling faces of the kids, giggly and silly as all children should be. Their photos show great promise, enough to warrant exhibits around the world in order to raise money for their education, and one child is given a rare opportunity that tragedy threatens to eclipse. The eight children featured in Born Into Brothels are an amazing and adaptive lot, and as Briski early on described how seemingly futile their futures are, my teary-eyed wife wanted to adopt them all. But there is an inspirational hope in Briski and Kauffman's film, tempered as it is by unfathomable societal realities. Children, it seems, are always children. And artistic vision can often come from the most unexpected sources. Image Transfer Review: Born Into Brothels is presented in its original 1.33:1 aspect ratio. The still photos taken by the children reveal a great amount of detail and color, while the on-location footage runs the expected gamut, from well-lit to grainy, depending on when or where it was shot. The print is free of any dirt or specking, and the presentation is more than suitable for a documentary shot under sometimes less than perfect conditions. Audio Transfer Review: There are a pair of audio choices for this documentary—a standard issue 2.0 stereo track, but also a full-bodied 5.1 Dolby Digital Surround mix, as well. The filmmakers employ a steady stream of Indian music throughout, and the luxury of the multi-channel option gives these percussive tracks a deep, resonant presence. Narration and interview segments don't have the same type of richness, but all are clear and understandable at all times. Aside from Briski's narration or the few scenes where she is shown on camera speaking, the dialogue/interviews are in the native Indian language, with forced English subtitles. Extras Review: Lions Gate has dressed up this release with a fair set of supplements, including a warm commentary track from directors Ross Kauffman and Zana Briski, recorded in May 2005 in New York City. Since Briski's narration is minimal in the film, this track fills in a lot of background information on the project, and she stresses how she never formally taught the children how to take photos, and instead wanted them to "stand up and be different" with the cameras. It's clear Kauffman and Briski have much more than simply a clinical interest in the children, and they also provide additional insight into life in Calcutta's red light district. My personal favorite was Reconnecting: An Update on the Kids 3 Years Later (09m:10s), a touching followup with Briski and Kauffman returning to meet the children and see how their lives have progressed. This piece shows far more promising information than does the actual end of the feature, which has some heartbreaking revelations. A segment entitled Special Video Commentary by the Kids Watching Selected Scenes from the Film (36m:19s), a fairly self-explanatory piece recorded in January 2005; a voiceover intro by Ross Kauffman mentions how nervous the filmmakers were to finally screen the finished film for the children. Presented in split screen—with the children on the left and the finished film on the right—this segment surprisingly is not all giggles and smiles, as reactions are not always positive. Next is a set of seven brief deleted scenes (12m:48s), including footage of Mamoni, one of the children who was not featured in the final cut, but who is also part of the Reconnecting piece. The Academy Award Acceptance Speech (02m:48s), with nominees read by Leonardo Di Caprio, has Kauffman and Briski giving their appropriate kudos. The Interview Segment with Charlie Rose (06m:07s) once again features Kauffman and Briski chatting up Born Into Brothels. There is also a 10-page insert booklet that showcases photos by the children, with brief descriptions of each. A set of 19 black-and-white production stills, a text blurb describing the Kids With Cameras program, and a small set of trailers (including one for the feature) are also included. The film is cut into 20 chapters. Here's another title I'm adding to my modest "year's best" list, a truly stunning emotional documentary about the children of prostitutes in the red light district of Calcutta who discover a new freedom thanks to photography. 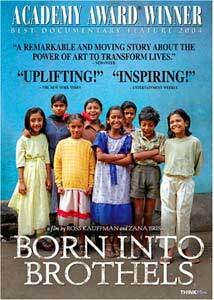 Directed with an unflinching honesty by Zana Briski and Ross Kauffman, Born Into Brothels reinforces the joyful adaptiveness and resilience of children even in the face of unimaginable poverty and hardship.